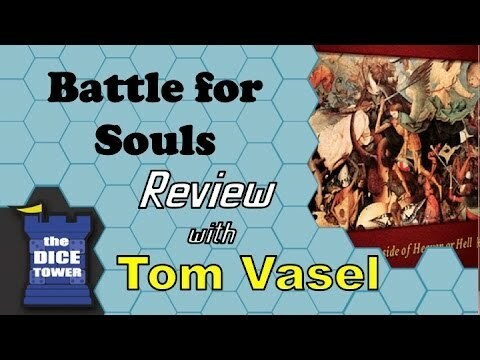 Battle For Souls is a card game pitting the seven archangels of heaven versus the seven princes of hell in a fight for the eternal souls of humankind. In the game, 1, 2, or 4 players choose the side of heaven or the side of hell. Each side will battle for 28 souls, which are worth victory points. Players add holy or unholy points on the souls in play based on how they use temptation, virtue, sin, intercession, holy relic, unholy relic, angel and devil cards. Earn enough holy points, and when the soul is reaped it goes to heaven, earning the side of good victory points; earn enough unholy points, and when the soul is reaped it goes to hell, earning the side of evil victory points. If a soul does not earn enough holy or unholy points and is reaped, it goes to purgatory where its victory points are not counted. Guiding a soul to complete purity or complete darkness before death and final judgment adds a new archangel or prince of hell to a player's arsenal. Influence on souls can be spent for more powerful cards that have special abilities, and allow a player to gain souls more quickly. Many strategic decisions impact play. Strategies include focusing on gaining more help from heaven or hell to increase your power, working to reap souls quickly from the start with little intervention from the angelic and demonic hordes, or balancing your play to ensure victory. Sin, Intercession, and Relic cards can be purchased for beneficial effects at the cost of holy and unholy points. These help to make for deep gameplay and excellent risk-reward scenarios. Invest in these cards to strengthen your position.